Ender’s Game producer, Bob Orci, fell in love with the Ender’s Game story when he was twelve-years-old; and almost every cast and crew member told me a similar story during my visit to the Ender’s Game film set last May. In fact, many crew members eagerly requested to work on Ender’s Game – not because they wanted to be a part of a blockbuster movie, but because they are fans of the novel. 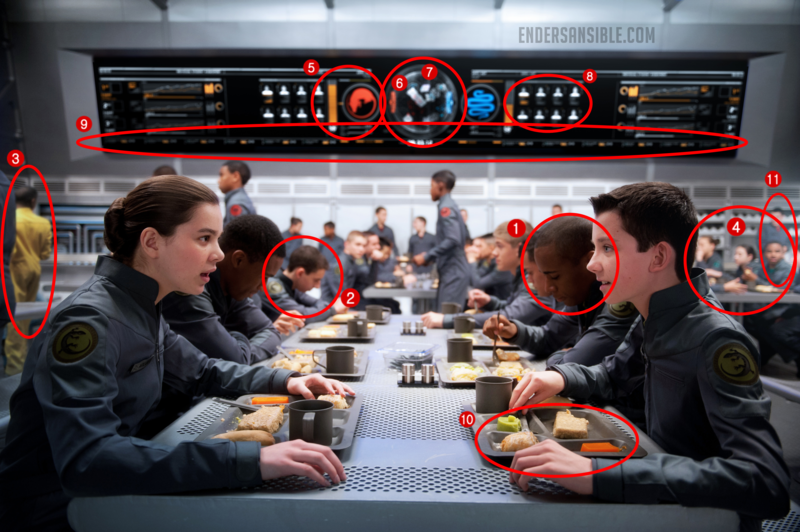 Not wanting to disappoint themselves, the many hands that helped put this film together ultimately worked to make the Ender’s Game movie three very important things: believable, relatable, and timeless. Wanting to get the story right, it took six months to write the first draft of the Ender’s Game movie and another sixty-three drafts to perfect what you’ll see on the big screen. Expect changes in any book to film adaption, especially in the case of Ender’s Game. Most of the story is told via Ender’s thoughts. Because we can’t have thought bubbles above Asa Butterfield’s head, many scenes from the book have been altered to develop Ender’s emotional anguish and unspoken victories over Colonel Graff and Major Anderson. Longtime fans of Ender’s Game need not worry that this will not be the Ender’s Game they remember from childhood. The scenes fans love to quote, the violence that surrounds Ender, and Ender’s final realizations will still be at the center of the story. The battle suits, flash guns, and desk tablets are all there; I even held them! With certainty, I can say that the highlight of my set visit was lying down in the launchie bunks during an interview with production designers Sean Haworth and Ben Proctor. Who else did I meet in New Orleans? I chatted with writer and director Gavin Hood, producers Lynn Hendee and Bob Orci, stunt coordinator Garrett Warren, Asa Butterfield, Sir Ben Kingsley, Hailee Steinfeld, Aramis Knight, Suraj Partha, Khylin Rhambo, Nonso Anozie and so many more. I can’t wait to share my interviews with them and the remainder of my set visit at a later date. Until then, enjoy this exclusive Ender’s Game movie still featuring Ender Wiggin (Asa Butterfield) and Petra Arkanian (Hailee Steinfeld) eating in the battle school mess hall with the scoreboard in the background. Click the picture for the full size image, or download the huge bitmap as a zip file HERE. 1. That’s Dink Meeker (Khylin Rhambo) sitting on Ender’s right. 2. That’s Ender’s bully, Commander Bonzo Madrid (Moises Arias) of Salamander Army, sitting on Petra’s far left at the end of the table. 3. This person in yellow is reminiscent of the girl from the first Ender’s Game movie still. This might be Colonel Graff’s assistant. 4. These students in the corner appear to have two army logos (a red, and a few teal-colored logos) different from the army logos released yesterday. Any guesses as to what armies these soldiers belong to? 5. Based on the army logos on the scoreboard and the gauge next to them, we believe the scoreboard is showing a battle between Rat and Asp Army with Rat Army in the lead. 6. This circle appears to represent a single spherical battle room. Those colored rectangles on either side of the circle are probably the enemy gates. Remember, the enemy’s gate is down. 7. Those white shapes in the center of the circle probably represent the placement of ‘stars’ or floating obstacles in the middle of the battle room. 8. There appear to be only eight students to each army, one commander and seven additional soldiers. There are a total of forty-one students to each army in the Ender’s Game novel. 9. We can’t make out that list on the bottom, but it might be army ranks or the ranks of individual soldiers. 10. Click the picture and take a look at the full size image for an up close of that food. We think it looks like breakfast. 11. Bonus edit: We’ve received confirmation that the student standing in the far upper right is Commander Pol Slattery of Leopard Army (Cameron Gaskins). A special thanks to Summit Entertainment and Lionsgate for allowing us to share this new movie still with our readers. The Ender’s Game movie will be released in US theaters on November 1, 2013.